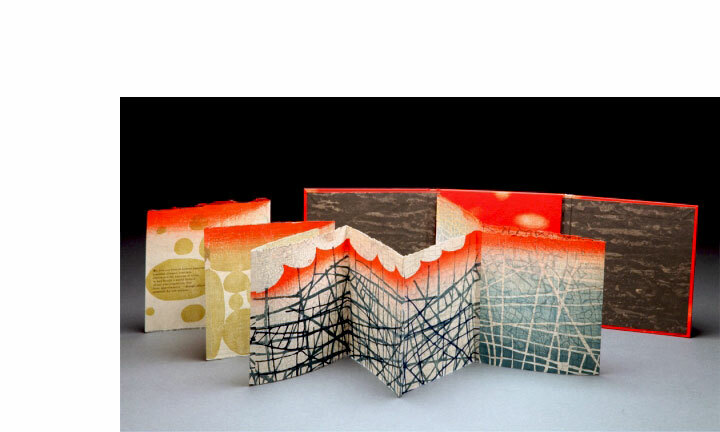 Karen Kunc: "My work as an artist/printmaker addresses issues of the landscape and our natural surroundings as direct influences from my Nebraska heritage, my daily experiences and viewpoints in the landscape of the plains and from extensive travel, and as artistic interpretation and contemplation on larger issues of the eternal life struggle, of endurance and vulnerability, growth and destruction." Lincoln, Nebraska: Blue Heron Press, 2017. Edition of 30. 9 x 6"; 6 pages. Accordion structure. Etchings printed in black, polymer relief in grey, and pochoir accents in color. Printed on artist-made watermarked paper of linen and cotton. 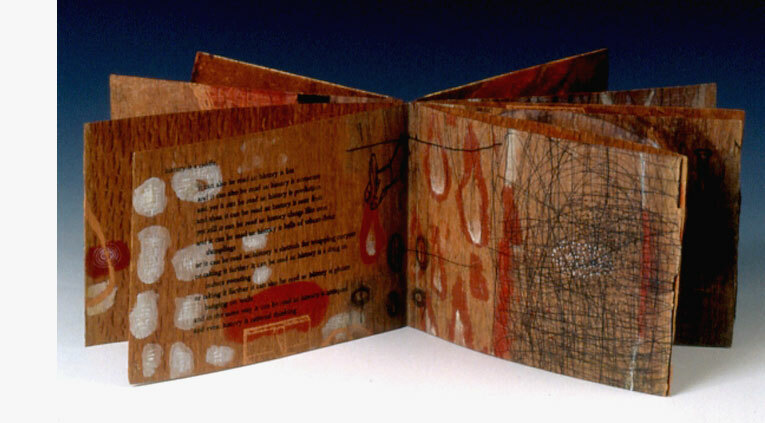 Accompanied by a tipped-in poem in handset type on woodblock printed vermillion Japanese paper. 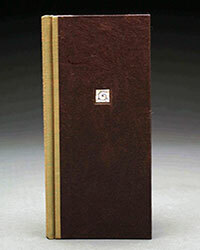 Bound by the artist into covers of Cave paper-covered with spine of silk bookcloth. Signed and numbered by the artist. Karen Kunc: "This book is a hybrid form in process and media that grafts and compiles vignettes alluding to historical texts on gardening. The images are graphically vibrant, with inherent energies and rhythmic flow of natural progressions and ornamentation, suggesting the 'tree of life,' twinning vines, the philosophers stone, and cascading floral abundance. Between are 'horror vacui' spaces of text-like swirls and watermarked light writing. Minimal color gradations highlight the structure and flow of the book; white dots & circles activate the eye and serve as attention points and an alternative language of hand marks or notations. All brings to mind gatherings of illuminations on specialized knowledge and 'natural magic.'" The poem is by Karen Kunc in a stream-of-consciousness style. Colophon: "Treatsyse is influenced by 'A Gardener's Labyrinth' by Thomas Hill (born c. 1528) printed by John Wolfe, 1586, in London." Poem by Grace Bauer Lincoln, Nebraska: Blue Heron Press, 2016. Edition of 15. 11 x 3" closed, opens to 11" x 15". Woodcut on Nishinouchi paper. Letterpress on handmade paper of cotton/abaca. Handset type of Romulus with Cheltenham Italic. 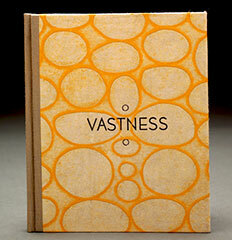 Sewn binding into flax covered boards with wood type title and silk bookcloth spine. Woodcut printed endsheets. Signed by the poet and artist. Numbered. Karen Kunc: "A print of elemental forms and natural references inspires a poetic voice that questions and establishes metaphors bringing full circle to printed intent and layered meanings." Lincoln, Nebraska: Blue Heron Press, 2013-2014. Edition of 20. 6.25 x 2.75" closed; extends to 25". 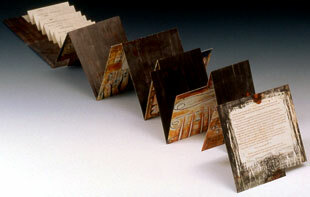 Accordion folded into boards extending from front pastedown foreedge. Mokuhanga woodblock prints on Nishinouchi and Shin-Torinoko papers. 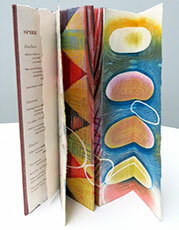 Bound in covered boards of printed paper with silk cloth spine. Letterpress titling and ornament. Signed and numbered by the artist. 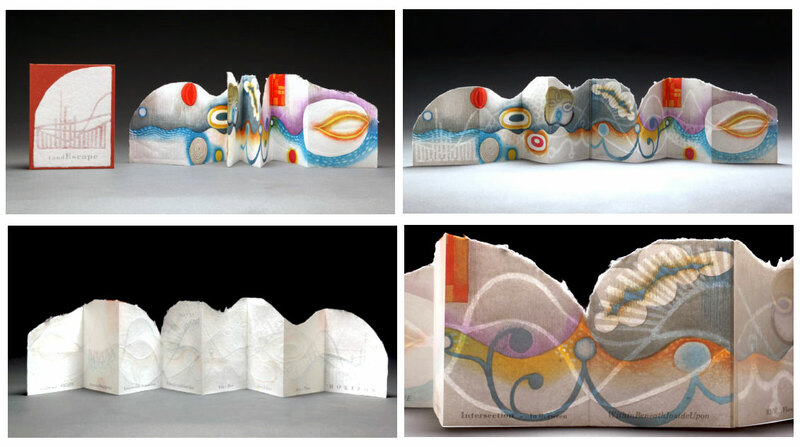 Karen Kunc: "Biomorphic and landscape elements alternate in subtle and rich vignettes across an expanse of pages. All are printed in the Japanese Mokuhanga watercolor woodblock process, and finally complied for this simple study." 5.25 x 4.25" closed; extends to 37". Accordion fold extending from front pastedown foreedge. Woodcut prints on Kitakata paper. Letterpress printed text on midnight blue Ingres paper. Bound in paper-covered boards with cloth spine. Signed, numbered, and dated by the artist. 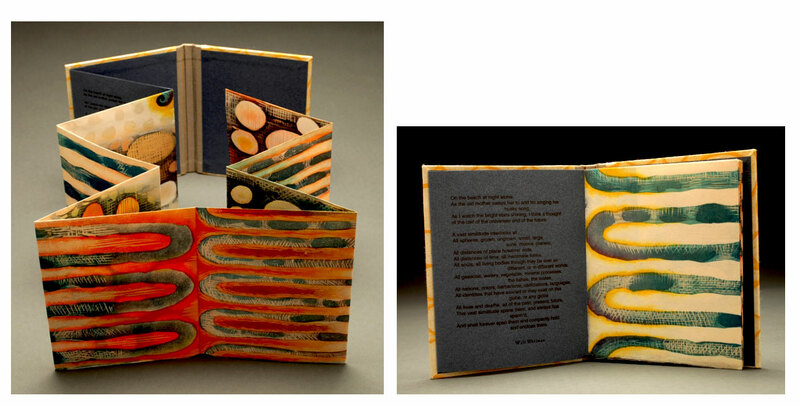 Karen Kunc's woodcuts accompany the poem "On the Beach at Night Alone" from Leaves of Grass by Walt Whitman. Karen Kunc: "A dual sided print expands literally and figuratively into rhythmic pulses of undulating waves, and a nebulous cosmos. This imagines the limitless spaces as a visual poem inspired by the words of Walt Whitman from Leaves of Grass." Avoca, Nebraska: Blue Heron Press, 2013. Edition of 10. 11" x 5" closed, 11 x 5" open; 13 folds. Woodcut and letterpress on Japanese Nishinouchi. Irregular accordion folding from front pastedown. 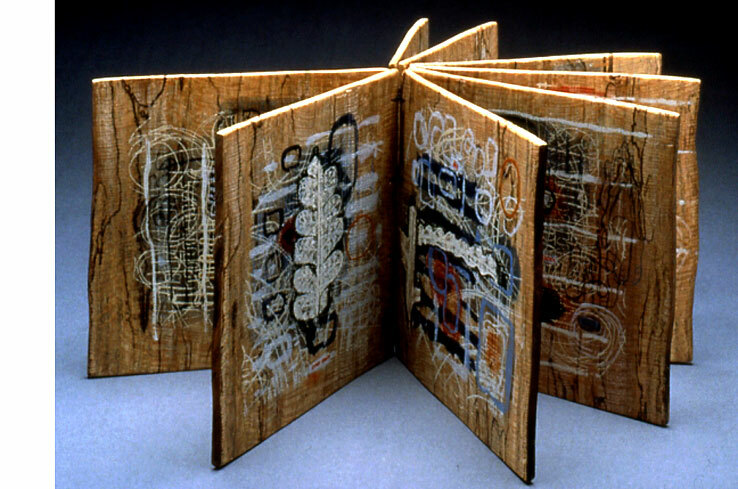 Boards covered with etching & mixed media decorative papers. Karen Kunc: "The cantilevered folds of a looming structure have subtle visual cues that seep and inundate behind and within. This edifice is made vulnerable by the hype and chatter of rumor and echoes; it is permeated by the consuming, swirling network of insistencies – the distractions of the media world we have created - that penetrates our every hour...fascinating, fanciful, insidious, precarious. " Avoca, Nebraska: Blue Heron Press, 2012-2013. Edition of 100. 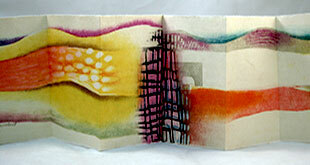 Small volumes: 8 x 4.25” closed, 8 x 8.5” open (varies by volume). Large volumes: 9.875” x 5” closed, 9.875” x 10.125” open (varies by volume). Processes: monoprint, pochoir, mixed media, letterpress. Papers and font vary by volume. 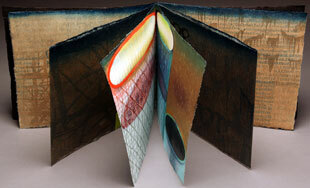 Tacket stitched into bookcloth spine, with intaglio printed paper-covered boards. Each volume numbered. Paper title label and volume label tipped on front board. 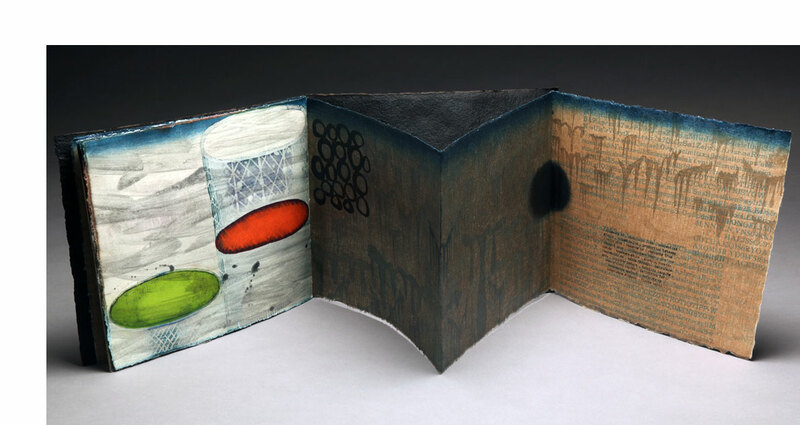 Each one-signature bookwork contains a recto and verso monoprint created by pressure printing with pochoir and mixed media, and a letterpress text on various papers. Volume No. 3: quote from Italo Calvino "Invisible Cities" printed in Kabel Bold, Lightline Gothic, Bodoni types with two foldout pages. Volume No. 4: quote from Guillaume Apollinaire "La jolie rousse" printed in Franklin Gothic & Century Medium types with two foldout pages. Volume No. 6: quote from Annie Dillard "Teaching a Stone to Talk" printed in Frankfort Roman & Romulus, & unknown types. Volume No. 20: quote from Jorge Luis Borges "The Aleph" printed in Century Medium type. Volume No. 21: quote from Italo Calvino "Invisible Cities" printed in Kabel Bold, Lightline Gothic, Bodoni types. Volume No. 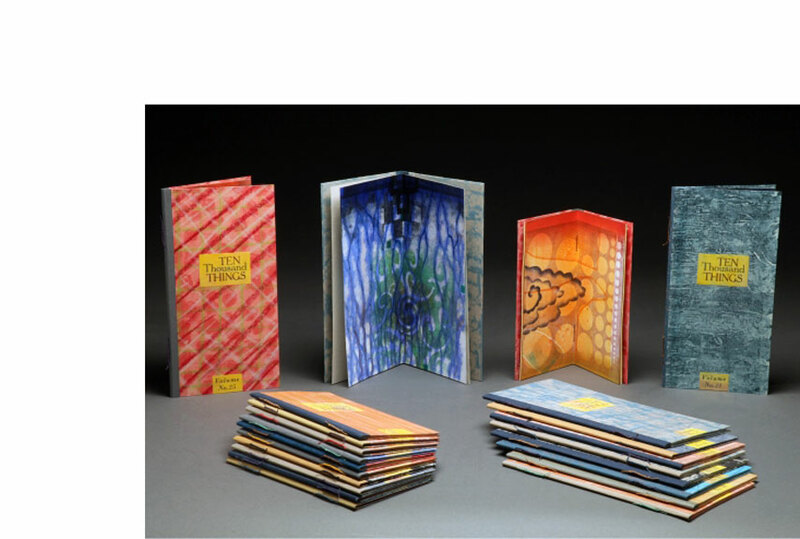 32: Marge Piercy "The seven of pentacles" (1982) printed in Univers & Metro, & unknown types with two foldout pages. Avoca, Nebraska: Blue Heron Press , 2011. Edition of 25. 6 x 5.75" closed, 6 x 62" unfolded; 20 pages. Double-sided accordion fold. Line etching, polymer, mokuhanga woodcut, and letterpress on Japanese Nishinouchi paper. 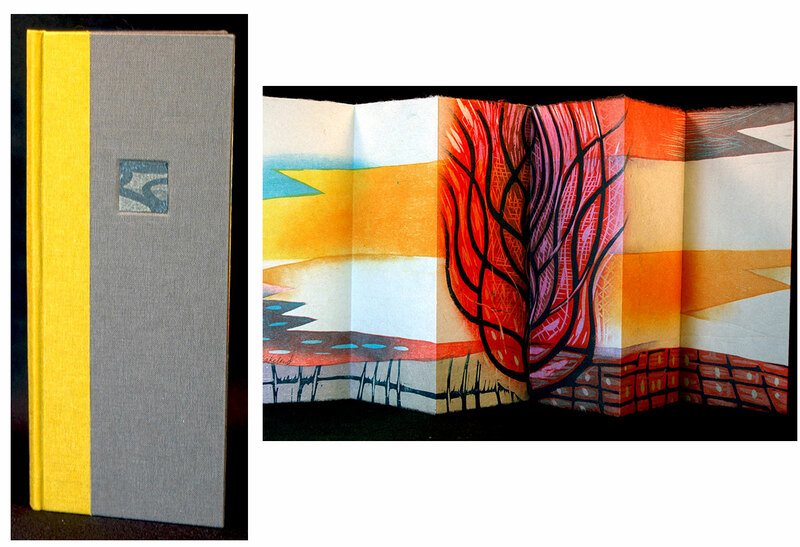 Bound in paper-over-board wraparound covers of hand printed aquatints. Printed title recessed in front board. Magnetic closure. Quotations from Umberto Eco's Baudolino and Denise Levertov's Sojourn in a Parallel World join with Kunc's signature prints to memorialize the victims of natural disasters. Colophon: "Various worn handset types are paired with excerpts from admired authors....The seeds of this book began four years ago in residency in NYC and continued slowly in Avoca, Nebraska." Karen Kunc: "In Memoriam, to those lost in disasters and tragedies everyday, everywhere. And to those left behind. Ever changed." Avoca, Nebraska: Blue Heron Press, 2009. Edition of 50. 6.25 x 10.25" closed, 10 x 42" extended; 12 pages. 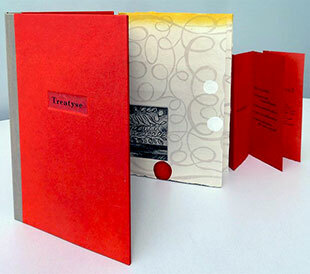 Accordion structure with gatefold center spread. Text letterpress printed in Cochin 11 point. Line drawing from photopolymer plates printed letterpress on a Vandercook 320. Woodcuts printed from birch blocks on a Takach etching press onto Japanese Nishinouchi paper. 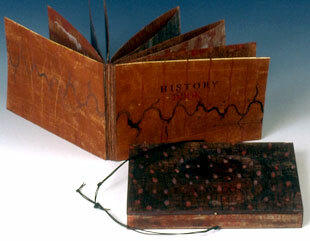 Bound into covered boards with decorative woodcut-printed paper and end sheets, and with a goatskin spine. 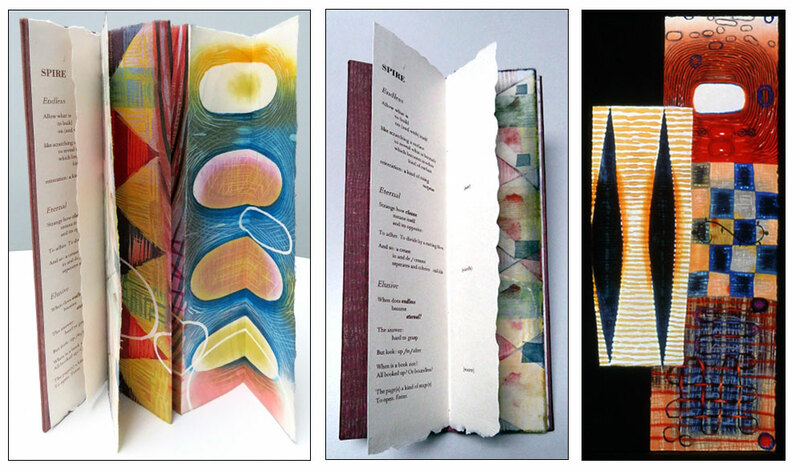 Blue Heron Press: "In words and images, micro-to-macroscopic layers of poignant meaning and memory are an intimately held and transient wonder, just as light melds recto and verso printing into one light-born envelope. Intimations are caught and lost in the act of reading, viewing, meditating, immersing. 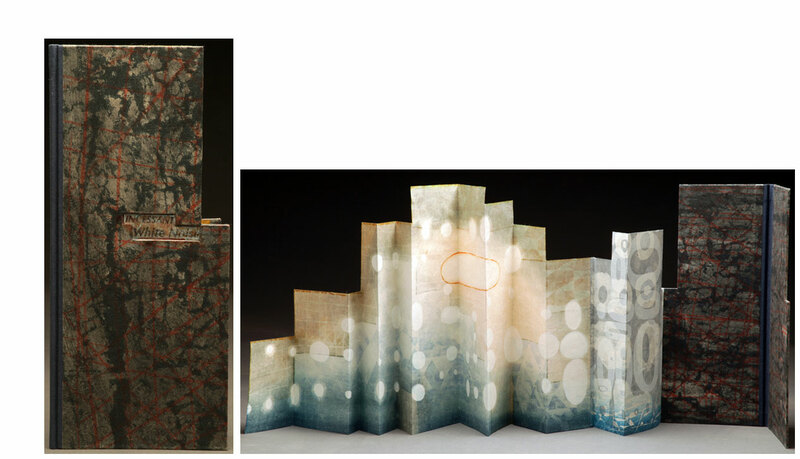 A fortuitous invitation from Longwood University, Virginia, pairs Robert Pinsky (Poet Laureate 1997-2000) and book artist Karen Kunc." Avoca, Nebraska: Blue Heron Press, 2006. Edition of 25. 4.75 x 9.25" closed; extends to 108"; 19 pages. Accordion structure. Text printed letterpress from handset 11 point Romulus. Copperplate etchings. Printed by the artist. Colophon: "From a distillation of museum visits worldwide, these classical gestures evoke the blessings and power inherent in the work of the hand. The poems are excerpts from the Sufi master, Hafiz (1320-1389), translated by Daniel Ladinsky." 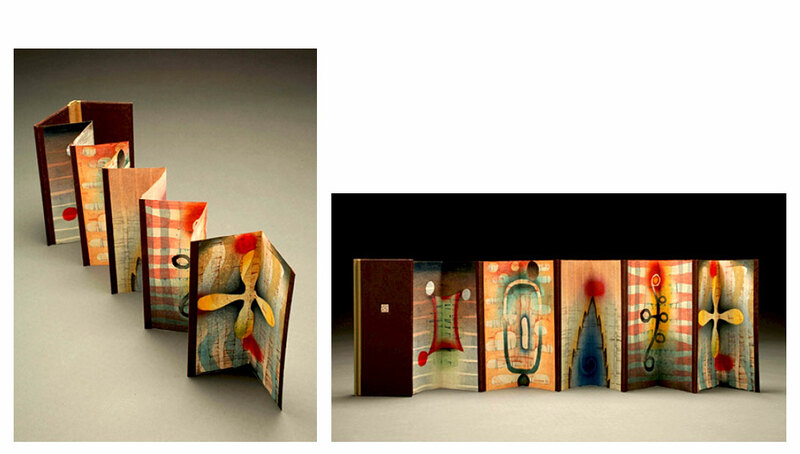 Karen Kunc (from her general artists’ statement): "The book is a classical form. Its function is accepted, known. Its feel is familiar. My images within this form allow for a validity, a 'real'-ness, and 'right'-ness. It is like seeing the truth. This comes about by this acceptance of the knowledge in books and our familiarity with its form. "But artists are also pointing out this tendency to blindly accept the printed page, and what is the meaning of so many words. Where do the words come from, who says them, and for what reasons? We all must be wise to real meaning, and important and meaningful experiences. And learn a willingness to follow curiosity and questions. The resource for all of us is within books and by reading, because so many voices exist, unclouded, within the pages of centuries. And when we 'read' the voice is inside ourselves." Avoca, Nebraska: Blue Heron Press, 2004. Edition of 18. 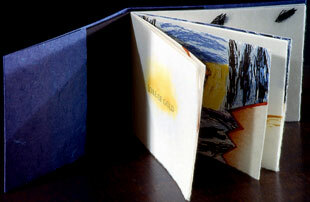 5.5 x 3.5" folded; opens to 63", 18 pages, with color etchings and aquatints printed on handmade paper of grasses and cotton rag. Letterpress printed text. 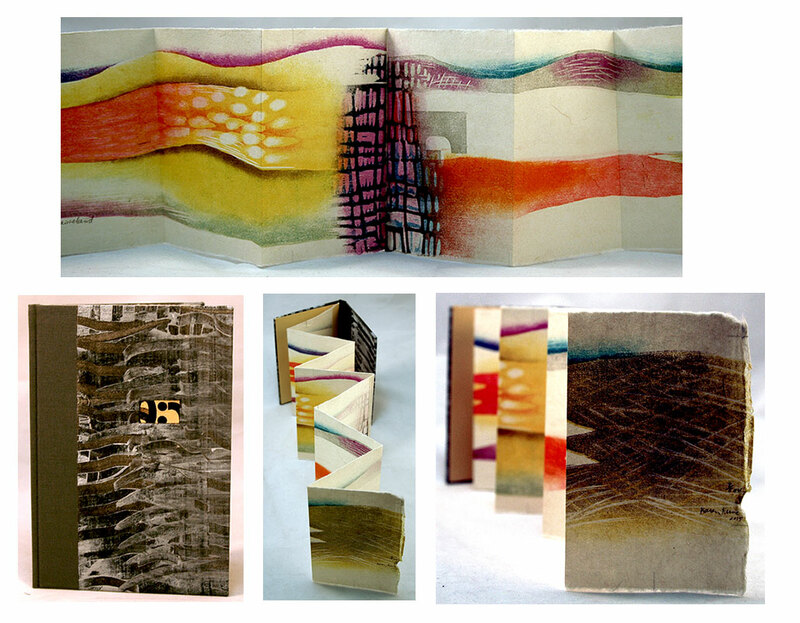 Accordion folded into covered boards. 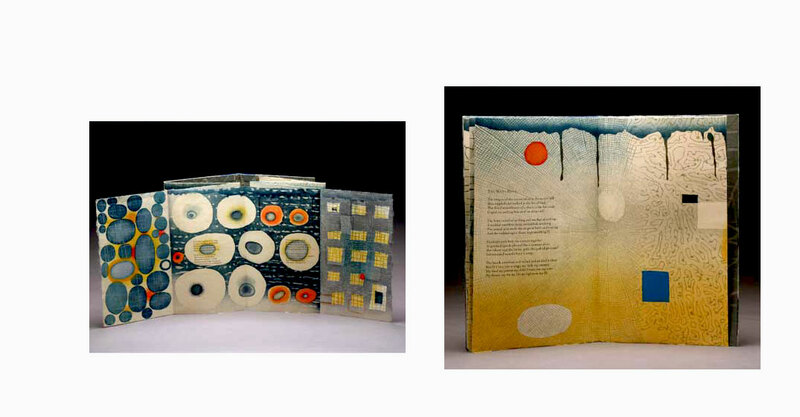 Karen Kunc: "This richly colored and detailed book reflects the seasonal transition of light, and the arrival of life. 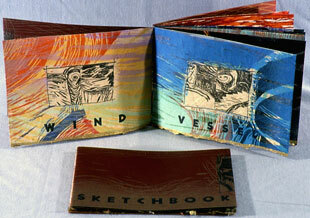 The etchings were created and proofed by the artist while in residency in Finland with generosity of friends and gifts. The aura of a special mid-summer is captured - and literally etched - for a handled memory." Avoca, Nebraska: Blue Heron Press, 2002. Edition of 200. 6 x 6" square when folded, 94" when opened (and hung). Text typeset at the Bradypress in Nebraska. 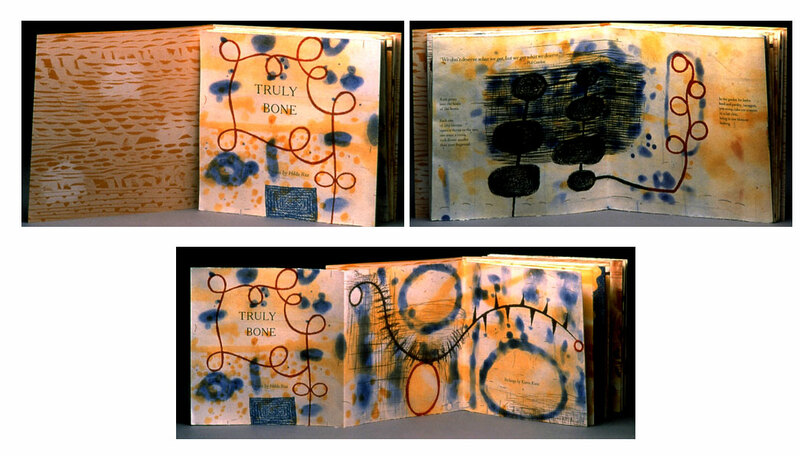 This multi segmented book moves through nature's profusion, desiccation, and human encroachment, ideas which were explored in a collaboration between the two artists. 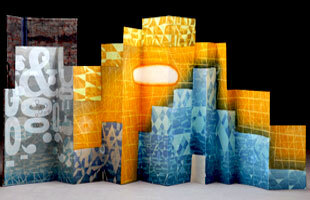 This project was made possible by the Artist in Residence program at the University of the Arts. 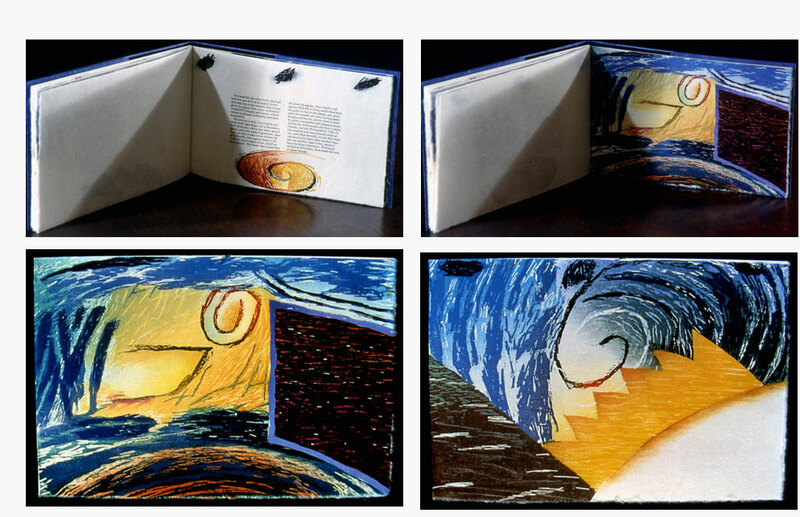 Kunc's vibrant color lithographs are on one side of the panels and Hansen's poems are on the other. 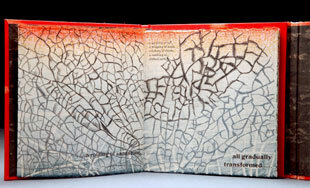 This is an ecological treatise printed from polymer relief plates onto Daphne fiber paper from Bhutan. Avoca, Nebraska: Blue Heron Press, 1998. Edition of 50. 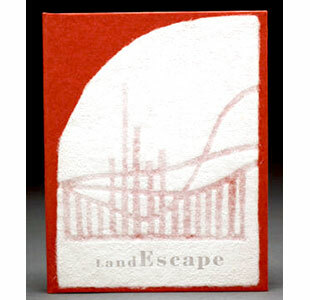 7.5 x 7.5” square closed; unfolds to 15 inches. 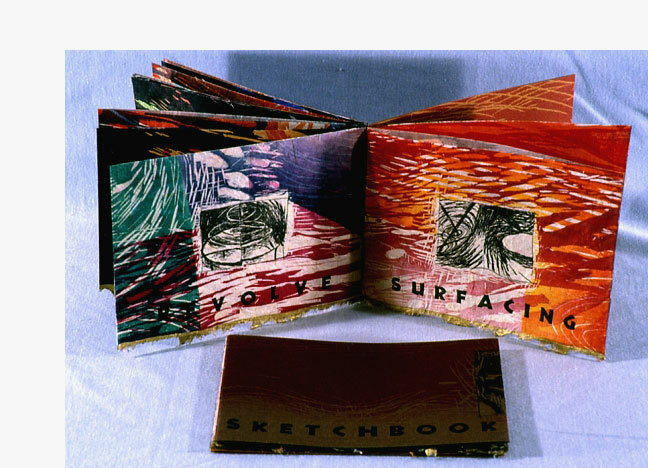 Hand printing processes integrate layers of color from aquatint washes, deeply bitten skeins of etched lines, and letterpress typography. The images are etching, spit-bite aquatint and drypoint from multiple copper plates using sixteen colors on Italian Alcantara cream paper. Romulus type. Signed. Words of self-reflection and revelation about physical mortality and the search for meaning. Kunc, in her intriguing style, creates a rich, tactile frieze of images which pulse with biomorphic abstractions, geometric permutations, and natural icons. Avoca, Nebraska: Blue Heron Press, 1991. Edition of 20. 6.5 x 6.25”. Relief and intaglio woodcuts on handmade Roma paper (dark red-brown). Letterpress on Nidegen with handcoloring. Sewn binding. Colophon: "Woven wattle, wheat waves, hay rolls, fence rows, mangers, chutes -- malleable, entwined, shaped, sequenced permutations of shifting screens -- herein the true rococo of my mind, memory and Impatient Hand draws origin and symbol further." Avoca, Nebraska: Blue Heron Press, 1990. Edition of 18. 5 x 7", 22 pages, typeface Neuland. Woodcut and letterpress on a variety of Oriental papers, with hand coloring. 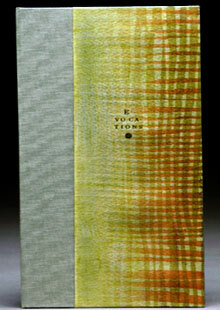 Multi-color, sewn binding with brown Canson paper covers. Single words accompany photo line engravings. Printed on Japanese paper in bright and deep color overlays. Colophon: "Sketching, testing ideas long held and discovering new -- watermarking handmade paper; superimposed overlays of woodblock printing; actual-scale drawings from letterpress engravings; hand embellishments and binding; pages of new history from old prints -- a stream of order -- entangled, surprising, incongruous -- a source book." Karen Kunc: "Extremely colorful and rich, this book is composed of small, detailed drawings and small pieces from larger prints, creating a micro- to macrocosmic view of an intimate visual language. 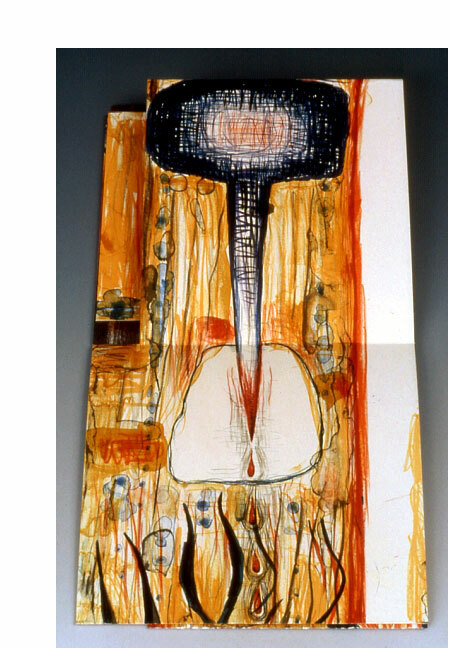 This is a personally revealing exploration of ideas and experimentation." Avoca, Nebraska: Blue Heron Press, 1986-1987. Edition of 20. 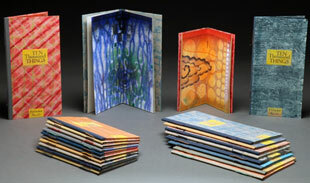 6 x 9", 12 leaves, multi-color with sewn binding and blue hemp covers. Woodcut and letterpress on Okawara paper. Text in typeface of Garamont. 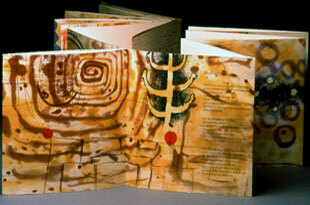 A pairing of early texts with Kunc's contemporary art. The text is taken from three sources: The Stone of the Philosophers, an undated 17th-century work by George Starkey; the Golden Tractate of Hermes Trismegistus (fourth or fifth century); and, Of the Nature of Things by Paracelsus (Theophrastus von Hohenheim) from 1650. All three concern the process of making gold. "Now you shall understand that the Ancient Philosophers made division of the Water to separate it into four substances; one to two and three to one; the one third part of which is colour; which is a coagulating moisture; but the other two thirds are the Weights of the Wise. “Take an ounce and a half of the humidity; and the midday Redness, the soul of gold, take a fourth part which is half an ounce. Of the citrine Seyre take similarly half an ounce. Of the Auripigment take half (which are eight) thus making a total of three ounces; and you must know that the Vine of the Wise is drawn forth in three, and the Wine of it is perfected in Thirty...."
Karen Kunc: "Text and full page woodcut illustrations alternate to create a vision and mystery surrounding the art of creation. Nature is animate within the medieval understanding and this contemporary imagery." Avoca, Nebraska: Karen Kunc, 2010. Edition of 10. 8.25 x 10.5" closed, 8.25 x 60" unfolded; 12 pages. 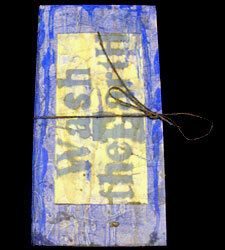 Woodcut, letterpress, photopolymer, mixed media on Japanese Nishinouchi paper. 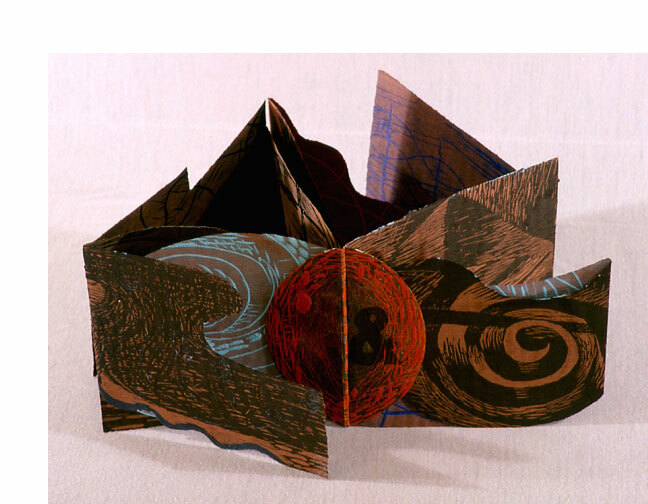 Accordion folded with center spread. Sewn into dyed black linen Cave cover paper with embossed title. Housed in a silk-covered box. Karen Kunc: "In this visually rich and elegant book, simple reservoirs of natural resources are symbolic emblems of what we contain, exploit, and upon which we all ultimately depend. 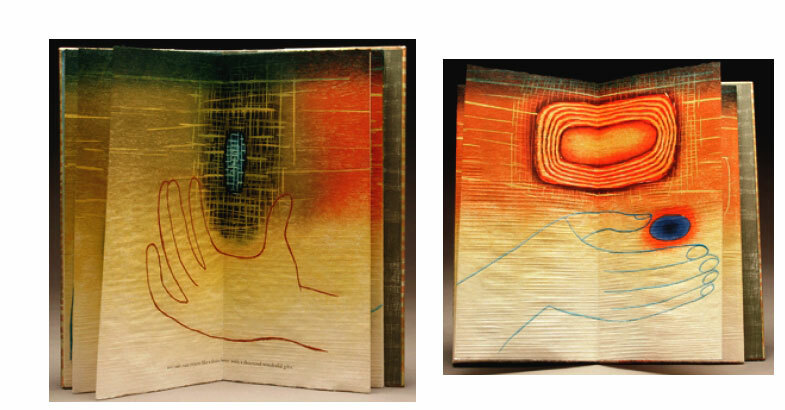 The printing is on front and back of the paper to create a 'light envelope' of interactions and color reversals, most appropriate for hand-held viewing in the book format. The content mirrors the human dilemma of the use of natural resources, as the color reduction woodcut process destroys once living matter in the creation of something meaningful." Avoca, Nebraska: Karen Kunc, 2001. One-of-a-Kind. 7 x 5 x 2"; 16 pages. Screenprint and gouache on wood pages. 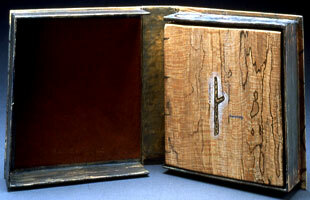 Exposed sewn binding. Housed in handmade box. Karen Kunc: "This richly filled unique work evokes a reading of micro-macro landscapes. Throughout, simple declarative text plays with the idea of consequences. natural forces, from the specific to the universal." Avoca, Nebraska: Karen Kunc, 2002. One-of-a-Kind. 5.25 x 7.25"; 16 pages. Screenprint, watercolor, and etching on gampi paper. 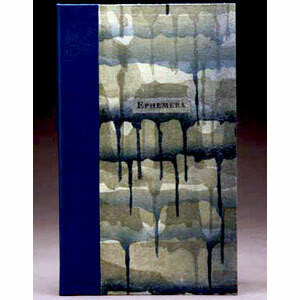 Includes collage and beeswax on brazilwood veneer pages. Pasted binding. Housed in decorative wooden handmade box. Leather tie closure. Text excerpted from Soul Mountain by Gao Xingjian, recipient of the Nobel Prize for literature in 2000, and translated from the Chinese by Mabel Lee. Lincoln, Nebraska: Blue Heron Press, 2015. Edition of 6. 3 x 7" closed, extends to 24". 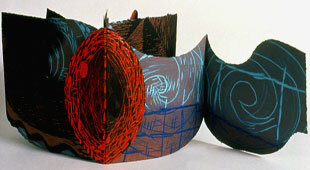 Accordion fold extending from foreedge of front pastedown. Color woodcut. Bound in cloth-covered boards with letterpress ornament. Signed, numbered and dated by the artist. 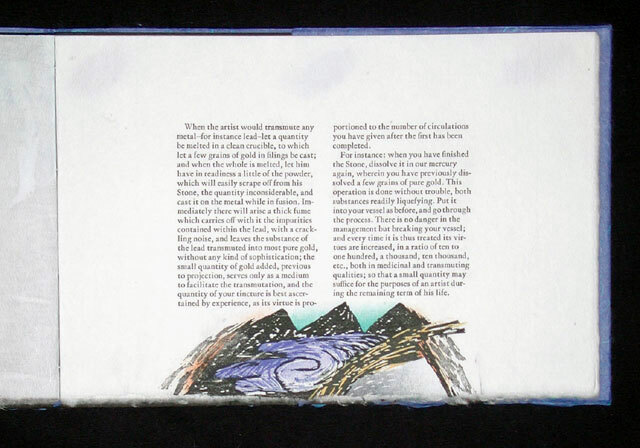 Lakeland depicts landscape encountered during a teaching stint at the Paper Book Intensive at Oxbow, Michigan. Lincoln, Nebraska: Blue Heron Press, 2015. Edition of 8. 3.5 x 5" closed, extends to 28". 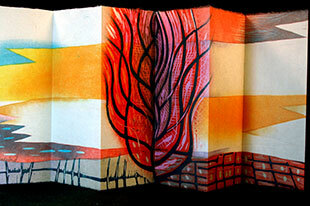 Accordion fold extending from fore edge of front pastedown. Color woodcut. 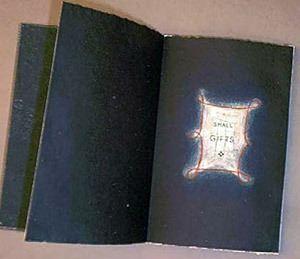 Bound in cloth-covered boards with letterpress ornament. Signed, numbered and dated by the artist. Prairieland depicts landscape encountered during a summer teaching stint at Cedar Point Biological Station in western Nebraska for UNL (University of Nebraska at Lincoln). Avoca, Nebraska: Blue Heron Press, 2012-2013. Edition of 3 variants. Prints: 8" x 8" open, 8" x 4" folded. Box: 9" x 5" closed. 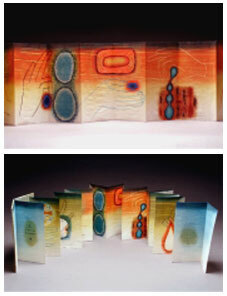 8 recto & verso folio prints from pressure printing and polymer plates with pochoir and acrylic on Torinoko paper. Text from inkjet, wood type, and rubber stamping. Laid in embellished covered box. Karen Kunc: "A long held concept is explored from the perspective of one who daily washes, who walks over the micro erosions in the road dust, who hopes for rain in the drought, who imagines vast ice fields and immeasurable expanses of sea while landlocked. All such speculation on watery phenomenon everywhere has ramifications that are real, mythic, poetic, and urgent. These thoughts have driven an experimental print series that is open ended and presented for conceptual connections."